Magnesium is more important than calcium, potassium or sodium as it is required to regulate them. The chief function of magnesium is to activate certain enzymes, especially those related to carbohydrate metabolism. Magnesium activates over 300 different biochemical reactions for the body to function properly thus making it a very important mineral for the body. Another role is to maintain the electrical potential across nerve and muscle membranes. It is essential for proper heartbeat and nerve transmission. Muscle contraction, glucose metabolism, electrical impulses of the heart, bone formation all rely on this mighty mineral to get the job done! If truth be told, the human body cannot function normally without magnesium. Sometimes when mysterious health symptoms arise it can be time to ask, "Am I magnesium deficient?" Magnesium is a class of mineral very unique unto itself. There are many experts in the field of health but we will rely on one who understands magnesium. From his book Holy Water, Sacred Oil, the Fountain of Youth, Norman Shealy, MD, Ph.D., states the following: "Every known illness is associated with a magnesium deficiency," and further states, "magnesium is the most critical mineral required for electrical stability of every cell in the body. A magnesium deficiency may be responsible for more diseases than any other nutrient." "Some 350 different enzymes within the body rely on magnesium," says Burton M. Altura, of the State University of New York Health Science Center in Brooklyn, New York. Altura, further states concerning stroke victims, "those who stroked out had the lowest levels of ionized magnesium when they stroked out. Yet, in some cases, the patients total magnesium concentrations were in the normal ranges." Magnesium is found in lower levels in the blood. The normal range for magnesium is 1.7 - 2.4 mEq/liter compared to sodium, which is 140 mEq/liter. Thus the problem of measuring accurate amounts of magnesium in the body is difficult because intracellular magnesium is what needs to be measured. Much of magnesium on the market needs to be converted to ionic form before effective results are manifested. Nano particle ionic form of magnesium goes intracellular which can eliminate many worries about magnesium levels being low due to poor absorption. There is a small portion of society that is aware of the enormous role magnesium plays in body chemistry. Most healthcare professionals do not consider the underlying consequences of low magnesium levels as a consequence to having good health. Americans are experiencing huge healthcare costs being laid upon them daily, why hasn't the awareness levels of magnesium deficiency become more publicized? The Journal of the American College of Nutrition published an article by Burton B. Silver, Ph.D., in which he makes his point very well concerning the inability of current methodology to measure magnesium levels within the body. Measuring serum magnesium is inaccurate because only 1% of the total body magnesium is found there. According to Dr. Silver, these measurements (serum levels) are of little use because they don't give an accurate status of magnesium levels needed within the body for health benefits. Accurate magnesium levels must be measured in intracellular spaces to attain true levels of magnesium that will then show superior benefits. Knowing the above information from Dr. Silver is accurate, is another reason we are convinced nano particle ionic magnesium is the best source of magnesium because it is in the form the body uses without biological manipulation before ingestion into cells takes place. Other forms of magnesium not in ionic from must be manipulated into ionic form to go intracellular and into ion channels of cells. Nano particles allow for more particle absorption and increased speed at which these magnesium particles get absorbed. One concern we should all have when taking life critical minerals, is making sure the proper transit time is observed. If products do not get absorbed they will be excreted. Why do people suffer from loose stools and even diarrhea when taking high quantities of magnesium? This occurs as non digested magnesium acts as a laxative because it has not been converted to ionic form before it enters the digestive system. The Journal of Clinical Endocrinology and Metabolism states: "Young men taking magnesium can slow bone turnover which is the routine breakdown and rebuilding of bone. Bone turnover is important in postmenopausal women because this process can contribute to bone loss and osteoporosis, a crippling embrittlement of bones." The University of Graz Medical School in Austria examined the ability of magnesium supplements to slow bone turnover in healthy young men. In that study, 27 to 36 year olds were examined and surprising results were obtained. Magnesium levels in the blood were lower. What a surprise, but the reason for the lower levels was, tissues such as bone were taking up magnesium in a disproportionate share of the biological active form known as ionic form magnesium. The ionic form of magnesium was being transferred intracellular and not staying in the serum. This sort of data validates our research that magnesium needs to be in ionic form for complete utilization. The Journal of Hypertension reports magnesium supplements offer therapeutic benefits to men with high blood pressure. Even those already taking medicine to control their hypertension saw extra benefits. Other studies have taken place around the world and one in particular was at the National Cardiovascular Center in Osaka Japan which showed a decrease in the blood pressure levels, especially in men with the highest blood pressure. In the journal Headache, March 1996, researchers reported that patients with clustered headaches had their acute headache aborted by magnesium therapy. "In clustered headaches, people suffer up to 20 bouts of pain daily in a single siege that can last for months. A single infusion of magnesium has ended those clustered headaches with some relief in 2 to 7 days. Among those who recovered the fastest were those taking ionic forms of magnesium." Cellulite: According to Dr. Susan Lark, MD in her newsletter, New Choices the Chemistry of Weight Loss, summer 2001, "Magnesium is critical for getting rid of cellulite. Many of the weight problems I have seen can be cured with magnesium." A British researcher found that 80% of fatigue patients lack magnesium. The reason magnesium is important is, it stops cortisol production, which makes your belly bigger and because it helps convert fatty acids into the anti-inflammatory prostaglandin. Dr. Lark, says she has seen inflammation disappear and women loss 10 pounds in one week. Chocolate: cravings for this delicious treat are associated with low levels of magnesium. Magnesium is a mineral lost during menstruation. Women who can't control their weight have found it easier to do so when they can nix the chocolate cravings. Test yourself with the chocolate test. Here it is. On Monday, do not take any magnesium and then eat a piece or two of chocolate and see how it tastes. On Wednesday, take a fair amount of magnesium right before eating the chocolate and notice the difference in how your tasted buds react to the taste of chocolate. Diabetes: Insulin is a hormone, which helps regulate glucose metabolism. Magnesium has been found to improve insulin's response to dietary sugar and improve the action of insulin in regulating blood sugar. Dr. Hans Nieper, MD: from his extensive research with compromised patients states the following "Magnesium improves the activity of white granulocyte blood cells and increases production of immune-defensive substances such as antibodies and complement factors." Dr. Nieper is an expert in cancer therapy and says there is a correlation between high levels of magnesium and health versus low levels of magnesium and poor health. Lukaski is assistant director of Agricultural Research Service Grand Forks Human Nutrition Research Center, Grand Forks, North Dakota. He and Nielsen, with the center's clinical nutrition support staff, showed that inadequate magnesium is associated with a need for increased oxygen during exercise. They found that during moderate activity, those with low magnesium levels in muscle are likely to use more energy and therefore to tire more quickly than those with adequate levels. The study's first phase provided 10 postmenopausal women with a controlled diet adequate in magnesium for 35 days. In the next phase, a low-magnesium diet provided less than half the recommended daily intake for 93 days. The last phase provided a diet adequate in magnesium for 49 days. The volunteers were subjected to exercise tests at the end of each dietary phase, along with biochemical and physiological tests. After consuming the low-magnesium diet, volunteers showed a significant overall loss of magnesium. They had lowered muscle levels of magnesium, and their red blood cells were at the low end of the normal range. The data shows that during the low-magnesium-status phase, the volunteers used more oxygen during physical activity, and their heart rates increased by about 10 beats per minute. " When the volunteers were low in magnesium, they needed more energy and more oxygen to do low-level activities than when they were in adequate-magnesium status," says Lukaski. The study was published in the May 2002 issue of the Journal of Nutrition. Heavy Metal poisoning: Magnesium protects the cell from aluminum, mercury, lead, cadmium, beryllium and nickel. Evidence is mounting that low levels of magnesium contribute to the heavy metal deposition in the brain that precedes Parkinson's, Multiple Sclerosis and Alzheimer's. It is probable that low total body magnesium contributes to heavy metal toxicity in children and is a participant in the etiology of learning disorders. Dr. Uzzi Reiss. Used by permission. The following is quoted from the book, "NATURAL HORMONE BALANCE" by UZZI REISS, M.D./O.B. GYN, published by Pocket Books Copyright 2001 regarding MAGNESIUM deficiencies. Dr. Reiss has a highly successful Beverly Hills practice and prescribes a private label Liquid Ionic Magnesium Concentrate for his patients. "Yes, we all need calcium for healthy bones, but you won't achieve good bone health without adequate magnesium. Magnesium increases bone elasticity. A deficiency can contribute to osteoporosis. Moreover, magnesium is often the nutritional missing link to menstrual wellness. Some studies have linked PMS to magnesium deficiency alone, on in combination with excess calcium. The mineral is a partner in more than three hundred enzymatic reactions in the body, including the generation of cellular energy and muscle relaxation, and the synthesis of fat, protein, and nucleic acids. The obsession with calcium in our society appears to be a major contributor to magnesium depletion. High intake of calcium interferes with magnesium absorption. In other words it makes an already existing deficiency worse. So we need to hear more than just the calcium message. We need to start hearing the magnesium message. What Makes Nano Particle Unique? What makes Nano Particle Ionic Magnesium unique is the way the magnesium ions are available for absorption. Notice we say magnesium ions and not milligrams. Most people are unaware of what a milligram is. Virtually all recommendations for magnesium supplements are given in milligrams. That has been the standard for years. But let's look at what a milligram is in a little more detail. Few have taken the time to analyze what a milligram really means. A milligram is a unit of mass. What is a unit of mass? From the American Heritage Dictionary we get a definition, which is, mass (mÂ²s) n. 1. A unified body of matter with no specific shape. 2. A grouping of individual parts or elements that compose a unified body of unspecified size or quantity. 3. A large but nonspecific amount or number. 4. The principal part; the majority. 5. The physical volume or bulk of a solid body. Let's take the components of Part 1: A milligram is a unit of mass, Plus Part 2: which is the physical volume, or bulk of a solid body which would then equal a milligram of magnesium in this case. It should be remembered that most magnesium products are sold as solids or mass particles and not ions. Now if we take the two parts and put them together what we now have is a bulk amount of magnesium, which weighs a certain amount per a certain volume. But, knowing magnesium is used by the body in Ionic Form, that from two Noble Prizewinner's, and that ion channels are how magnesium goes into cells we must look beyond the simple definition of what a milligram is and look at how it is utilized by the body. Does the magnesium from most magnesium supplements go intracellular in bulk, dry or powder form? No, they must first be converted into liquids. That is correct, the powder that you were taking from another product must ultimately be converted into a liquid form otherwise it won't because it can't go intracellular in powder form. So, what happens? What is happening is the bulk powder or the milligram of magnesium, is being converted by the body into an ionic solution converted from the powder, bulk or milligram. If that were not the case, absorption would not happen and thus a very limited amount if any, of mass / milligrams would be utilized by cells. We must further realize the body does not convert most of the magnesium into ions from the powder. That is because of limiting factors such as buffering and ineffective digestive systems. Looking at Nano Particle Ionic Magnesium, it can be seen and understood that ions of magnesium are what is being absorbed and ultimately not milligrams which are bulk powders. 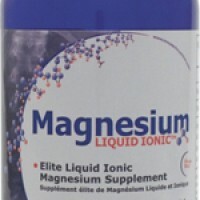 It is the ionic form of magnesium that is being utilized by the cells and not mass / milligrams or bulk powders. The following question should be in everyone's mind. Why would I want to take a milligram of a bulk or mass powder that needs to be converted into ions when I can get the perfect solution ready for absorption? That is the miracle of Nano Particle Ionic Magnesium. It needs no alterations to be absorbed. It goes to the cells directly, where it is needed and utilized. About 5 months ago I was experiencing anxiety, irritability, tension, muscle cramps more than usual, couldn't get to sleep and above all, an irregular heart beat. This last one really worried me and made me more anxious. It all came to a head and finally one evening I asked my husband to take me to the hospital as I thought something was going on with my heart. I couldn't quite explain it, it wasn't a stabbing pain or cramping but my heart was racing, my blood pressure was up and my blood sugars were elevated. I found out in ER that I was low in magnesium and once they gave me a bag of liquid magnesium, I could feel the tension and anxiety disappear and my body completly calmed down. I went to the computer when I got home and looked up low magnesium and found out that a whole lot of symptoms that I was experiencing were attributed to low magnesium. I have found out from other people that if you have close to no magnesium, you could have a stroke or a heart attack and one lady had both. I found your product at the health food store and have tried other products in liquid and pill format. The pills do not work efficiently and of all the products I have used, yours works the best! It is absorbed the fastest and works the fastest! I am also being tested every three months for my magnesium and potassium levels and they have been normal for five months! Thank you so much for such an amazing product and it has made my life a whole lot calmer! Non-Medicinal Ingredients: distilled water, acetic acid, stevia, raspberry flavour, potassium sorbate. Note: The magnesium level is represented in elemental figures. Many other products on the market will not disclose elemental figures as it may look like there are not putting very much of the mineral in the product. Health Canada's new labelling laws require us to disclose the elemental figures. Remember, this is ionic and is almost completely absorbed. "Just a note to let you know the success I have had personally with using the Liquid Ionic Magnesium introduced to me some months ago. It has had such a profound change on the health of my heart that I am recommending it to my patients who have had heart problems, and they are seeing great results as well!" "About 5 months ago I was experiencing anxiety, irritability, tension, muscle cramps more than usual, couldn't get to sleep and above all, an irregular heart beat. This last one really worried me and made me more anxious. It all came to a head and finally one evening I asked my husband to take me to the hospital as I thought something was going on with my heart. I couldn't quite explain it, it wasn't a stabbing pain or cramping but my heart was racing, my blood pressure was up and my blood sugars were elevated. I found out in ER that I was low in magnesium and once they gave me a bag of liquid magnesium, I could feel the tension and anxiety disappear and my body completly calmed down. I went to the computer when I got home and looked up low magnesium and found out that a whole lot of symptoms that I was experiencing were attributed to low magnesium. I have found out from other people that if you have close to no magnesium, you could have a stroke or a heart attack and one lady had both. I found your product at the health food store and have tried other products in liquid and pill format. The pills do not work efficiently and of all the products I have used, yours works the best! It is absorbed the fastest and works the fastest! I am also being tested every three months for my magnesium and potassium levels and they have been normal for five months! Thank you so much for such an amazing product and it has made my life a whole lot calmer!"